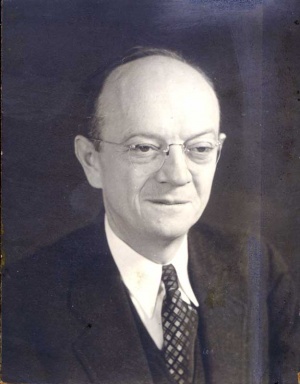 Amos E. Kreider: pastor, Bible teacher, influential conference and missions leader; was born 19 October 1889 to John H. Kreider and Magdalene Ebersole-Kreider, at Sterling, Illinois. He married Stella R. Shoemaker, Freeport, Illinois, on 5 September 1917; they were the parents of Robert S. and Gerald R. Kreider. Educated at Goshen College and Garrett Biblical Institute, A. E. Kreider returned to teach at Goshen College, 1917-1918, 1921-1923. He also taught at Bluffton College and Witmarsum Theological Seminary between 1923 and 1931 and at Bethel College (Kansas), 1935-1943. Ordained at Maplewood Mennonite Church, Topeka, Indiana on 5 May 1915, he served also as pastor at Science Ridge, Sterling, Illinois (1918-1921); College Church, Goshen (1921-1923); First Mennonite, Bluffton, Ohio (1931-1935); and Eighth Street, Goshen (1943 until retirement). Significant church board memberships include: Mennonite Board of Education (Mennonite Church, 1920-23); Board of Missions (General Conference Mennonite, 1935-53); Board of Mennonite Biblical Seminary (GCM, 1945-1962), in which he became a significant bridge in Mennonite Church-General Conference Mennonite Church relationships. Amos Kreider died 11 February 1976. Waltner, Erland. "Kreider, Amos E. (1889-1976)." Global Anabaptist Mennonite Encyclopedia Online. 1987. Web. 24 Apr 2019. http://gameo.org/index.php?title=Kreider,_Amos_E._(1889-1976)&oldid=134069. Waltner, Erland. (1987). Kreider, Amos E. (1889-1976). Global Anabaptist Mennonite Encyclopedia Online. Retrieved 24 April 2019, from http://gameo.org/index.php?title=Kreider,_Amos_E._(1889-1976)&oldid=134069. Adapted by permission of Herald Press, Harrisonburg, Virginia, from Mennonite Encyclopedia, Vol. 5, p. 498. All rights reserved. This page was last modified on 17 May 2016, at 19:08.